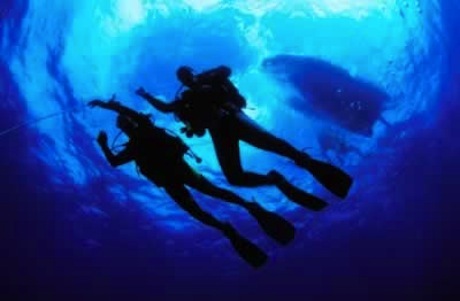 Nicola gives her thoughts on scuba diving and talks about her first experience with it. Todd: Nicola, you were talking to us the other day that you went diving in Australia? Nicola: That's right I did. Todd: Wow, so what was it like? Nicola: Well, actually it was quite scary to be honest. When I first started I did an introductory course which was just maybe like two days. And so they just sent you out with all of the equipment, put you in the sea and guided you, but then when I did the real course we started in the swimming pool which was fine and it was all great fun. Although, there were two men on my course who completely freaked out and had to leave. Nicola: Yeah, so that was fine but then they took us out to sea which was a bit different. Yeah, they made us set up our own equipment, I mean they still checked us and everything so we didn't die but we had to put on our own equipment. We had a diving buddy who I was with and I was with my friend Graham, who I was traveling with anyway and we went down into the sea. We went down maybe fifteen meters. And they always say like 'Don't Panic' just keep breathing normally and everything. But I did kind of panic a bit. Nicola: So then I rose to the surface really quickly which you know, you're not supposed to do in diving. So I went up really quickly. Luckily we weren't deep enough to do any damage but my diving buddy Graham was having a great time down there looking at shipwrecks and didn't even notice that I was missing. Todd: What a terrible guy. Todd: Wow! Did they fail him? I hope he failed the course? Nicola: No, he passed. He paid enough money. He passed. But it meant that I couldn't go diving for the rest of the day cause I had gone down quite deep so that was a shame, but..
Todd: That's terrible. But you didn't hurt yourself, you didn't come up too fast? Nicola: No, I was fine in the end but it was a shame because that was the end of my diving day. But we had a few more days to do it. Todd: So now you are comfortable diving. You don't freak out anymore? Nicola: I don't freak out anymore but I couldn't go diving now on my own because it has been so long. Yeah. We went diving after an introductory course, and it was scary. They went diving in Mexico last year. Did you take an introductory French course? They kept telling us not to panic, but I did kind of panic a bit. Try not to panic. How can we fix this? She always panics if she is late going somewhere. There were two men on my course who freaked out and had to leave. Do you freak out before a big exam? She really freaked out when she lost her job. I rose to the surface quickly, which you're not supposed to do in diving. The ball rose to the surface in the water. She isn't supposed to chat on the internet. It was a shame that I couldn't go diving anymore for the rest of the day. What a shame that you broke your arm during the summer. It was a shame you had to work and couldn't come to the airport. It's a that you were too sick to go to the concert. I enrolled in an sewing class for the fall. Did you see that turtle rise to ? Are you going to in Hawaii? You are arrive at exactly 5 o'clock. He really when he found out his girlfriend was pregnant. She is going to when she hears that.